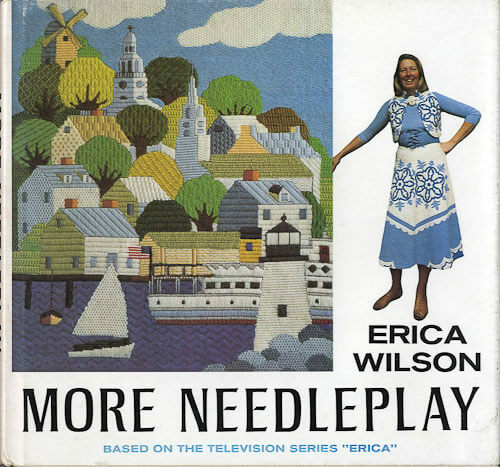 So very sad to hear the news that Erica Wilson, “America’s First Lady of Stitchery” died earlier this week. There is no doubt that she played a critical role in the revitalization of needlecrafts in mid century America — an influence that cannot help but to have affected interior design even more broadly. You know how much I love my bargello pillows. Needlework, in general — well, we do it with tender loving care, as a very personal act of creation, love, giving to our families. When we do needlework, we are creating a family heirloom. We are also “being” one with the earth. Thank you, Erica. Above: Above: a photo of Erica Wilson at work, taken as part of an amazing series by TheSelby.com in 2010. 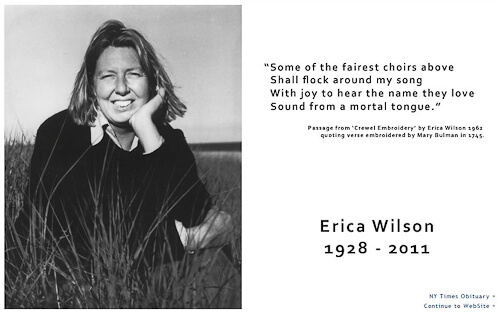 Above: The opening page of EricaWilson.com — what a lovely tribute. Here, I will gather all that the important biographical resources that can find online about Erica Wilson. To millions of needle workers, Erica Wilson is America’s First Lady of stitchery. A graduate of the Royal School of Needlework in London, Erica was invited to teach in the United States in 1954. News of her classes spread and she was soon teaching groups all over America in classes, lectures and seminars. Amongst her celebrity students were the wives of Thomas Watson, founder of IBM, Mrs. Rodney Proctor who’s husband was CEO of Proctor and Gamble, Dorothy Doubleday of the publishing firm, Julie Nixon, Rosie Greer and many others. 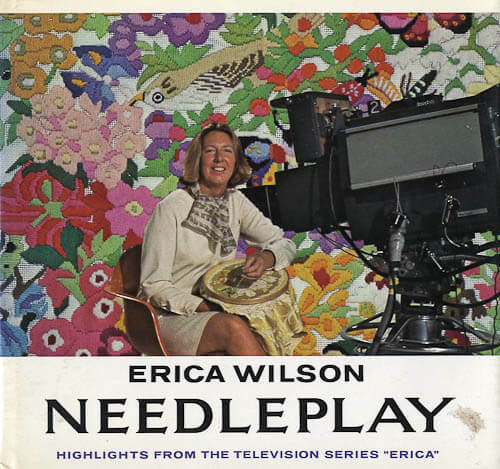 When students confessed they couldn’t remember all the stitches she taught them, Erica wrote her first book “Crewel Embroidery” published in 1962 by Charles Scribner’s Sons, which subsequently sold over one million copies! Since then she has written sixteen other books and produced and starred in two television series for WGBH seen on PBS nationally and the BBC in England and Australia. Her television series and books brought her fame on both sides of the Atlantic. She opened her first store in Nantucket, which has become a “must visit” attraction for the past 45 years. She became the exclusive designer for a national kit manufacturer, designed sheets, fabrics and wallpaper, wrote a bi-weekly syndicated column and became the spokesperson for a national organization teaching needlework by party plan. 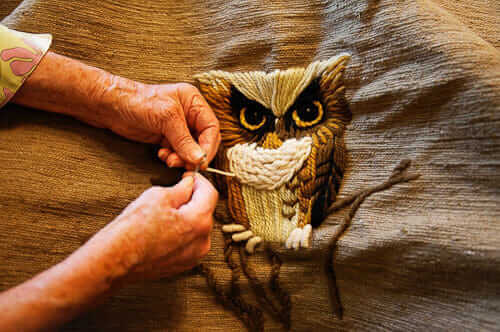 She has produced four videos on needlepoint, quilting, knitting and cross stitch. Erica designed and manufactured exclusive needlepoint kits for the Metropolitan Museum of Art as well as her own wholesale collection available in through fine Needlework shops. Her shop in Nantucket is a Mecca for needlework enthusiasts and now, together with her daughter, Vanessa Diserio, they have turned the shop into a destination for chic jewelry, casual and elegant clothing, Eres swim wear and accessories. Erica and her husband, Vladimir Kagan, the well-known modern furniture designer, divide the time between their homes in Nantucket, Palm Beach and New York. They have three children and six granddaughters. My followup story with images of some of the needlework in Wilson’s private collection — love love love. An AMAZING photo shoot on The Selby of Ms. Wilson and her husband Vladimir Kagan (also a design rock star) in their apartment in New York. Thanks, Cathy of California, for pointing me to this wonderful page. Viva la color! A 2005 feature story in the New York Times, in which Home & Garden reporter Joyce Wadler spends time with Ms. Wilson and Mr. Kagan. The New York Times’ obituary of Ms. Wilson. The London Times’ obituary of Erica Wilson includes additional, wonderful information — Ms. Wilson was British. The NYT says she did famous needlework based on this famous Unicorn tapestry. Did you know that Erica Wilson was married to famous furniture designer Vladimir Kagan <– read my interview with Vladimir Kagan. What an amazing, creative, power couple of mid century America! I met her briefly a while back with her husband, Vladimir Kagen. She was gracious and self effacing. I regret that I didn’t know her better. I have several of her books and her style is so sophisticated. I probably have never heard her name before, but probably have seen these kits in thrift stores over the years. I love doing hand embroidery myself, and have a collection of embroidery patterns from the 40s & 50s. I had a college art teacher who went to the Royal School of Needlework…Earlier this year I was looking that up to see about Prince William’s bride Kate’s dress…amazing handwork. Although I never saw or met her, I have spent many hours with the “creativity” of this fine lady. She will be missed. Her handiwork kits, yarns and designs were always of the highest quality. I grew up embroidering Erica Wilson’s gorgeous designs. Looking back, she was the first superstar crafter I knew about, and I loved her design sense. RIP, Erica, and thank you for giving me so many hours of enjoyment. I think a woman of this magnitude, and her life story, is such a huge influence on all the growing handmade crafters of the world. Now, as the handmade movement takes a strong foothold once again, we need more bold and beautiful women such as the likes of Erica Wilson. Her legacy lives on in so many ways.